A San Antonio charter school is taking action after a teacher gave students an assignment asking them to list the "positive aspects" of slavery. A San Antonio charter school is evaluating its curriculum and textbooks after students were given an assignment in which they had to list the “positive aspects” of slavery. This is absolutely unacceptable. 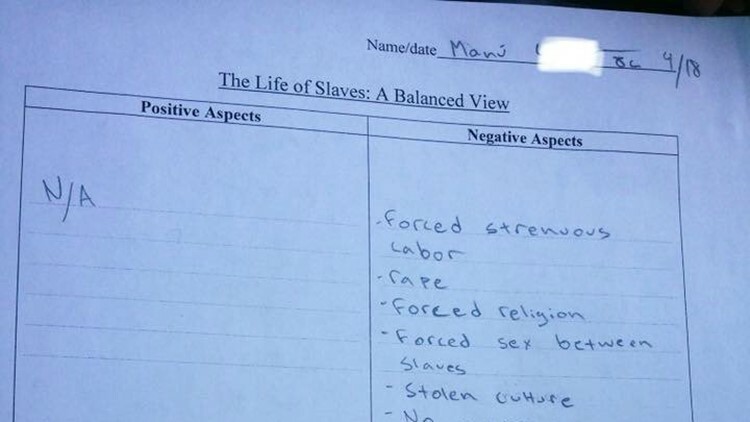 A @GreatHeartsTX charter school in San Antonio asked students to complete a “balanced view” assignment about slavery, requiring them to list the “positive aspects” of slave life. The teacher worked from a @pearson textbook. Great Hearts Texas, who controls the charter school in question, identified the assignment as originating at their Monte Vista North campus in an eighth grade class. We will also conduct an audit of the American History textbook we're using, Prentice Hall Classics: A History of the United States. If we deem this textbook imprudent we will permanently remove and replace it with a history book that accurately reflects our values. In the meantime, we encourage anyone who has further questions or concerns to contact our Director of Communications Yvette Reyna 210-888-9475 ext. 3 or Yvette.Reyna @GreatHeartsTX.org.